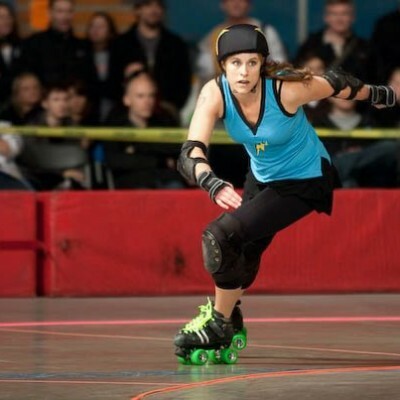 As a derby skater, you’re probably almost always at practice. We all know that we need to eat well so that we can give our absolute best each time we hit the rink, but what does that mean? There’s no ONE right answer. The options will be different for each athlete. Some folks do well with a well-balanced meal a few hours before practice, some like to snack within the hour before practice starts and eat afterwards. There’s not a one-size-fits-all with sports nutrition, you have to find what your body tolerates best, and give it what it wants! Make sure to eat a protein source to help reduce the markers of muscle damage, eat a carb source to enhance short-term high-intensity performance, eat a fat source to slow digestion, and make sure to include your veggies. Also, drink plenty of water. A decent pre-practice meal could look like: a palm-sized portion of cooked chicken, half a sweet potato, and all the leafy greens you want. For healthy fat, you can top the greens with olive oil, or add some nuts to your chicken! Keep in mind the closer to practice the meal is, the less time you have to digest, so a shake with protein, fruits and veggies, and healthy fats is often a good choice. Here’s how to make a Super Shake: 1 scoop protein, 1 handful of veggies, 1-2 handfuls of carbs (usually berries), 1 thumb-size of fats (nuts, nut butter or oil), and liquid to mix (usually water). For example: 1-2 scoops chocolate protein powder, a banana, a handful of beets (blended – go well with chocolate), a tbsp of peanut butter, almond milk for consistency, and coconut on top. 1-2 scoops vanilla protein powder, an apple, a couple of spoonfuls of canned pumpkin, some soaked chia seeds, water, and cinnamon. Be adventurous, experiment with flavour profiles, you might come up with something awesome! Lots of skaters I know will make a large shake, drink half before practice and then half during or after. Do shakes make you feel too sloshy inside? Make your protein snack portable! Brownie Balls – These can be found on pretty much any paleo recipe site named “Paleo Brownie Bites” or “Fudge Babies”. 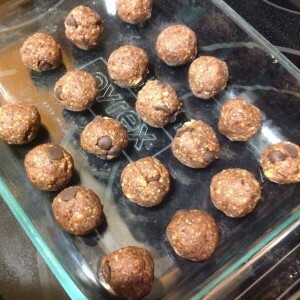 Take the above ingredients (excluding the protein powder), add 1/2 cup of rolled oats, and 1/2 cup shredded coconut. Grind in food processor. Slowly add water until the batter is thick and sticky. Stir in protein powder. Line an 8×8 baking pan with parchment paper (leaving enough paper over the edges of the pan to lift the bars out by). Press the mixture into the pan, Bake at 325 for about 20 minutes. Cool, cut, enjoy! How about you? What are your favourite pre-practice snacks? Let us know in the comments! Banana with a smear of peanut butter was a favorite pre-practice snack. I tend to eat a meal afterwards instead of 2 hours before.